Thousands of pounds have been raised by an appeal in memory of a man killed in a car crash. Paul Armitage, 29, a church clock repairer and keen bell ringer, from Fleckney, died in a collision on November 10 last year. Shortly after his death, his family launched an appeal to pay for a new bell to be installed in the village church where he was married, where he rang the bells and where his ashes have been laid to rest. His father, Geoff Armitage, said: "We have been overwhelmed and humbled by the response we have had to the appeal. We have had donations from across the British Isles." About £3,000 has been pledged to date. Paul, who had married wife Anne last summer, was killed when his sports car was involved in a collision on the A5199 at Arnesby. Hundreds of people attended his funeral service at the parish church of St Nicholas, in Marston Trussell, near Market Harborough. Mr Armitage had often rung the bells at the church. The ringing immediately before the funeral service was carried out by his family and his godparents, Mary Burton and Neil Skelton. Many of the mourners came from Ireland, where Paul worked on restoring civic and church clocks. 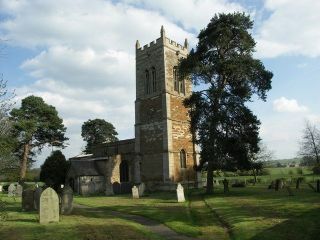 The appeal will add another bell to the peal of five in the tower at St Nicholas. The new treble bell will the first to be installed for half a century. Geoff, who lives in Husbands Bosworth, is the captain of the Marston Trussell bell ringing team. He said: "We have five bells but we need another treble at the top to complete the sound. "We are raising money in memory of Paul because we believe it would be an appropriate memorial to him." The new bell will have to be forged and tuned to blend in with the existing bells. Geoff said: "We are trying to keep the costs down by doing a great deal of the work ourselves." Even so, he estimates it could cost £5,500 to complete. Contributions have come in from far and wide. "We have had donations from throughout Britain and from both Northern Ireland and the Republic of Ireland," said Geoff. He said several fund-raising events, including a car rally, would be held in the coming months. Marston Trussell resident Barry Badger said: "The bells ringing across the village are a traditional reminder of what is good about life in rural England. "I support the appeal to add another bell to the tower in memory of Paul Armitage. "I am pleased the fund-raising is going so well." People wishing to make a donation can send a cheque made out to the Paul Armitage Memorial Bell Fund to Church Treasurer Mrs Jennifer Bradshaw, Essex Farm, Sibbertoft Road, Marston Trussell. LE16 9TZ.